"People should not be afraid of their governments. Governments should be afraid of their people.". 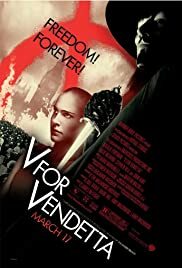 In a world in which Great Britain has become a fascist state, a masked vigilante known only as "V" conducts guerrilla warfare against the oppressive British government. When "V" rescues a young woman from the secret police, he finds in her an ally with whom he can continue his fight to free the people of Britain.